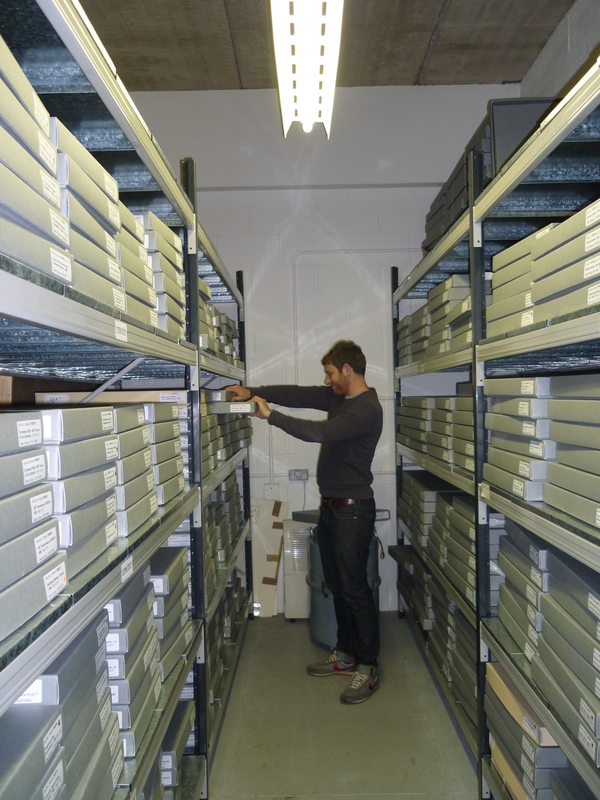 The Philatelic team is busy auditing the BPMA’s post 1985 stamp artwork collection, in preparation for its move to a new storage facility. We are half way through checking the location and housing conditions of approximately 12,000 pieces of adopted and unadopted artwork. Every piece of artwork must be packed safely to prevent damage during transit and location control must be maintained so that nothing is lost. An unadopted design by Ralph Steadman for Appearance of Halley’s Comet, 1986. The collection, which includes pieces by David Gentleman, Quentin Blake and David Hockney, comprises artwork across a range of forms and sizes including photographs, paintings, drawings, transparencies, digital images and plaster casts. The stamp artwork collection is diverse in its subject matter and style, and it is intriguing to see how different artists have tackled the same subject. The proposed designs for the Appearance of Halley’s Comet issue, for example, include scientific illustrations; images of the comet passing over earth in 684, 1066, 1301 and 1910; and bold, cartoon style artwork by Ralph Steadman – four designs of which were chosen for the 1986 issue. One can imagine the debates behind the final selection. Boxes of stamp artwork in storage at Christie’s. Our new home at Calthorpe House will allow us to showcase this fascinating design history resource, which, as yet, has been largely unseen by the public. Since Royal Mail first issued Christmas stamps in 1966, over 17 billion Christmas stamps have been printed in Britain. The Christmas 2013 stamp issue goes on sale today, signifying the start of a dramatic increase in social mail and the sale of the most popular stamp issue of the year. 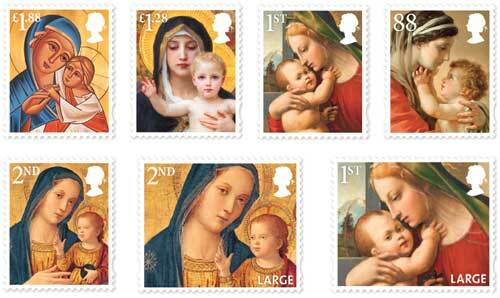 Christmas 2013 Madonna and Child stamps available from 5th November. The 2013 designs are of a religious nature, following a long standing tradition of alternating between religious and secular themes. Royal Mail’s objective was to create an issue reflecting different artistic representations of the Madonna and Child across the widest possible timespan, and emphasise diversity in Britain. To emphasise Britain’s diversity, Fadi Mikhail was commissioned to create a Neo-Coptic inspired design, which is featured on the £1.88 stamp. Christmas 2013 presentation pack available from the Royal Mail shop. 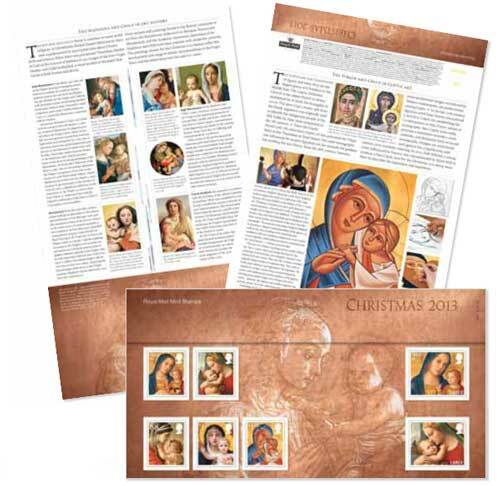 The design brief is reminiscent of the 2005 Christmas stamp issue, which illustrated artistic interpretations of the Madonna and Child in different cultures. A striking image printed on the £1.12 stamp was created in coloured sand by Aboriginal Australian artist Dianne Tchumut. 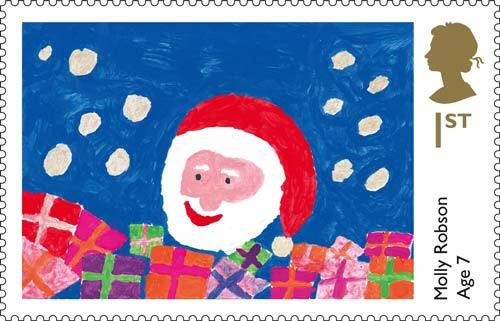 Additional handstamps available with the 2013 Christmas stamps. 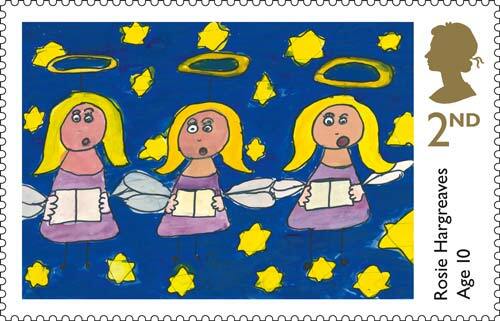 This year, alongside the religious stamps, two stamp designs have been created by school children. 239,374 school children aged between four and eleven responded to the question “what does Christmas mean to you?” and their entries can be viewed in an online gallery at www.royalmailstampcompetition.com. One entry, by Charlie Miller; age five, depicts a pillar box in the snow, which is one of my personal favourites. The two national winners, whose designs are printed on 1st and 2nd class stamps, were selected by a panel including The Prince of Wales and Tasveer Shemza. 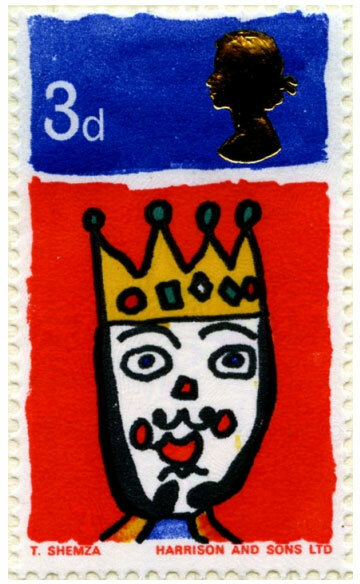 Shemza, when she was six years old, designed a winning stamp portraying King Wenceslas for the first Christmas stamp issue. 1966 3d Christmas stamp designed by Tasveer Shemza. The winning designs also needed the approval of The Queen, as with all stamp issues. 2013 marks only the third occasion that a British Christmas stamp has been selected from competition entrants. This stamp, designed by Samantha Brown; age five, was a winner in the second national competition, held in 1981, and depicts Santa Clause with a rather charming smile. 1981 11½p Christmas Stamp designed by Samantha Brown. Christmas stamps have featured the work of renowned artists including Axel Scheffler in 2012, Quentin Blake in 1993 and, memorably in 2010, the team behind Wallace and Gromit. 2012 Christmas stamps designed by Axel Scheffler. Christmas stamps from 1993 designed by Quentin Blake. 2010 Christmas Stamps featuring Wallace and Gromit. 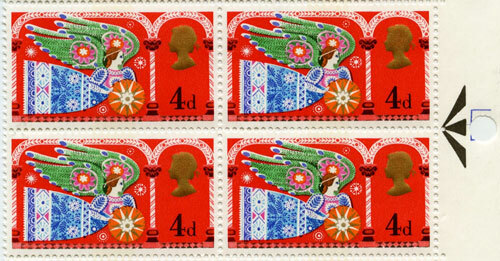 While rehousing sheets of stamps from the 1960s, I came across the wonderful Christmas 1969 4d stamp, which features an angel in a floor length, colourfully patterned dress with contrasting patterned wings and headband. The style is highly evocative of late 1960s counter culture fashion, which drew influences from Eastern cultures. These fashions were championed by the hippie movement who, widely involved in anti-war protests, utilised the style to demonstrate a rejection of the establishment. The Christmas 1969 stamp is a window into this era and its aesthetics. Christmas 1969 4d stamp – a window on to 1960s sensibilities. Christmas stamps symbolise the important role of communication in the festive period and map the national run up to Christmas. The build-up of excitement begins alongside the sale of the first Christmas stamps as people ponder Christmas card lists, invitations to parties are sent and letters to Santa composed. The post-before deadline marks the crescendo of preparations, as parcels are rushed to the Post Office and internet shopping cut off dates are frantically met. The distinctive, red pillar box, often capped in snow, is a common feature on all kinds of Christmas illustration including cards, stamps and wrapping paper; demonstrating the intrinsic connection between Christmas and the post in cultural memory. 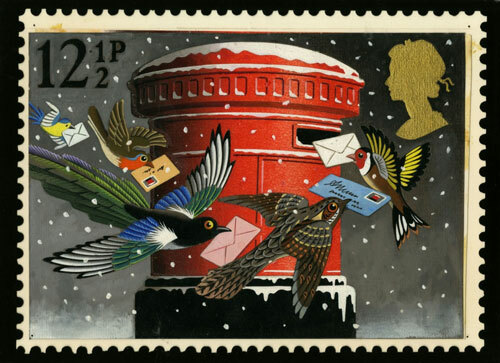 Original artwork for the 12.5p Christmas 1983 stamp. 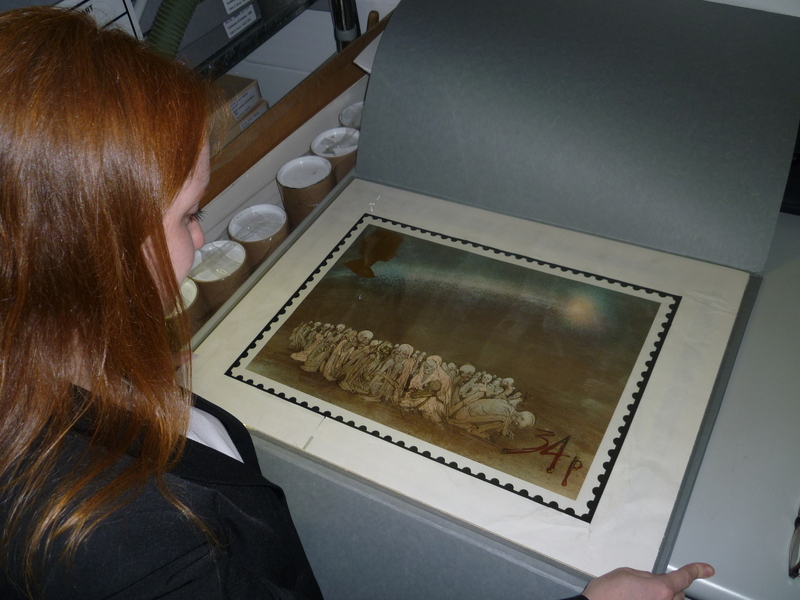 The British Postal Museum and Archive is holding an exhibition at The Treasure House in Beverley from 7 December 2013 until the second week in February 2014 entitled Christmas through the Post; exploring the rise and importance of the post at Christmas time. An accompanying online exhibition, hosted by the Google Cultural Institute, is planned for the future. Keep checking our website for more details and for the final closing date of the exhibition. Following the issue of the new Christmas Robin stamp on 5th November 2013, the BPMA have produced official limited edition first day covers featuring the new stamp designs issued by the machine. These first day covers feature the new stamp design with the unique overprint for the BPMA machine (reads “The B.P.M.A.”) and have been produced on official BPMA covers and cancelled with the official British Postal Museum & Archive cancellation stamp dated for the first day of issue. Visit www.postalheritage.org.uk/robin2013 to purchase a first day cover. Limited edition of 50 available.